U.S. cargo shipments contracted throughout 2015 and 2016. This was evident in both rail and trucking. But trucking is special: 70% of goods in the U.S. get shipped by truck. 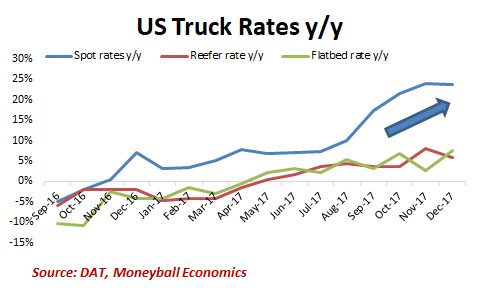 So, naturally, inflation in the trucking industry has a major impact throughout the economy (a ripple effect, if you will). Truck contract rates began to rise on a year-over-year basis in 2Q17, moving steadily higher to 5%. More importantly, spot rates surged to 20+%. That’s the tell-tale sign of inflation. Demand explains a lot of the pressure. Strong farm harvests pushed up loads. Also, the hurricanes sparked a scramble: to ensure product inventories, to haul away the damage, and to haul in building supplies. That’s on top of already growing demand. Supply has also been a problem though. Starting Dec. 18th, Federal regulations mandated electronic logging of hours spent driving. Many truckers decided to quit instead of working under conditions of extra cost and less income. The combination of higher demand and fewer truckers is adding enormous cost pressure in the supply chain. 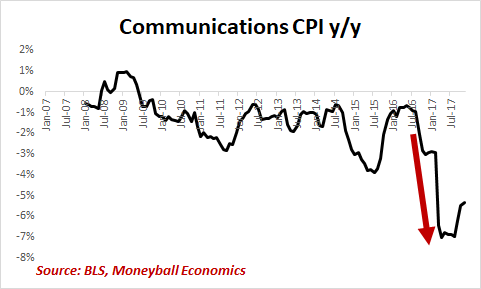 Last year I pointed out that CPI was already reporting 2% inflation. We just needed to look past the single line-item of wireless services. Here’s the math that goes into calculating CPI. Communications Services are 3% of total CPI and 4% of CPI ex-food & energy. Wireless services are about half of the Communication Services. Starting in 2016 and accelerating into 2017, the CPI of wireless services deflated at an incredible and accelerating rate: -14% y/y. In essence, for almost 2 years, wireless services deflation has been shaving 20 basis points (bps) from the monthly CPI ex-food & energy. This, of course, is nonsense. It was so ludicrous, even the Fed was forced to comment on it. Put differently, CPI ex-food & Energy has been running at 2%. But as the data shows, that deflation is slowing down. 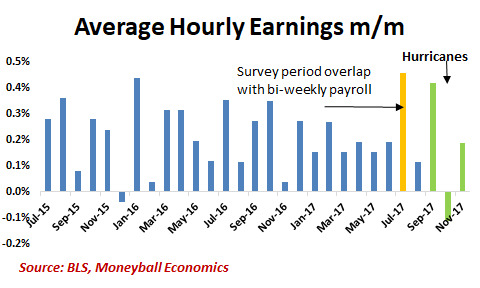 Average Hourly earnings have jumped recently for transient reasons. They jumped in July because of the timing of the survey period (ends on the 12th) and the payroll period (ends on the 15th but day of week varies). They jumped again on the hurricanes in September. Although they dipped in October, the hourly rate is still high and reflects the lingering impact of the hurricane. Indeed, Construction and Transportation are where the impact has been focused – both sectors where the hurricane drove up demand. Certainly, the accelerating trucking rates demonstrate that wages in transportation will only continue to inflate. And homebuilders are reporting that they have had to pay higher wages. Look past the transient factors and there are signs of accelerating demand for workers. Overtime is especially important: employers prefer to pay overtime instead of hiring new employees. 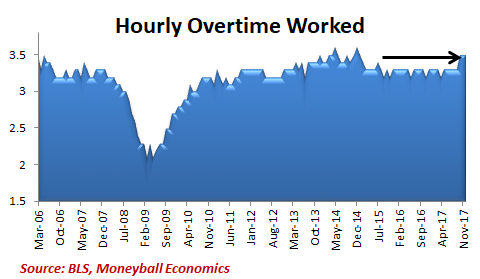 At a certain point, sustained overtime leads to more hiring and more wage pressure. That’s what we are seeing. Wages moved up strongly in December, at the highest rate in over a year (if we look past the anomalies of the Hurricanes and the July event). KEY TAKEAWAY: We’re starting to see signs of inflation across some of the most important metrics economists look at… yet it’s not being widely reported. The major hurricanes in 2017 had a huge impact that rippled through the shipping and trucking industries. Meanwhile, people are working more hours and more overtime in recent past.